This event was spectacular -it reminded me of the NBA Slam Dunks extravaganza! Hundreds of men and women tennis professionals lined the courts waiting to see how fast they could serve. Five policemen were on the courts pointing their radar guns at each serve that whizzed by them. It was the only time I wanted to be on a policeman's radar screen. After five rounds, only two remained. Much to my surprise it was me against the #1 player in the world, the legendary Martina Navratilova. The winner would receive two free tickets to travel anywhere in the world on the fastest plane in the world, the Concord. What fun it was that day to serve my best that day. I served 105mph and won the event! I held that title for over five years. Soon after, I retired from tennis and was able to walk away from this great game satisfied. After giving my heart to Jesus Christ, I was not ready to serve on another court, the King's Court. I was eager to begin a different kind of service - on the King's Court. 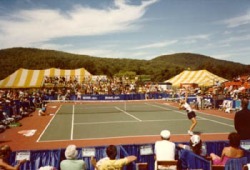 Serving was my strength as a professional player player. I would simply mustered all my power into a serve, sprint to the net, and hit a few sharp volleys and was done with it - next point. The best kind of serve is when you hit the ball so well that the opponent can't return it. So, what are we waiting for? Let's go serve Him up!